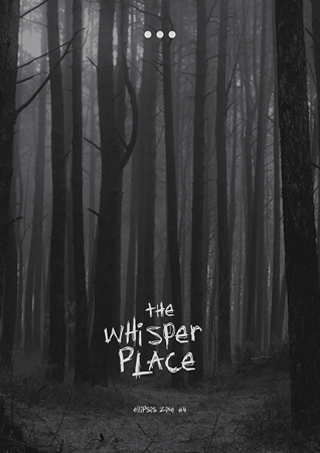 Ellipsis Zine, Four: The Whisper Place. A collection of creepy and unsettling flash fiction. 800 words or fewer, from 23 of the best contemporary flash fiction writers. This collection was compiled by Jennifer Harvey and Steve Campbell. It includes the beautifully crafted words of: Philip Berry, Sian Brighal, Paul Crenshaw, Ashling Dennehy, Emily Devane, Joely Dutton, Kate Finegan, Anita Goveas, Paul Gray, Donna Greenwood, James Harris, Gaynor Jones, Andy Leach, Cate McGowan, Callum McLaughlin, Dave Murray, Jonathan Ochoco, John-Ivan Palmer, Aeryn Rudel, Amy Slack, Paul Thompson, Hannah Whiteoak and Maura Yzmore.